Here’s a beautiful and stylish log home that has gabled and shed dormers in the two upstairs bedrooms and a centred large gabled dormer that has step windows to bring in the natural light to the living area below. The wrap around porch gives this log house construction all the aesthetic appeal you could dream of. The Ledgewood is a 1,728 square foot log house with three bedrooms, two bathrooms, an upstairs loft, open concept and downstairs cathedral ceiling. On the main floor of this beautiful log house construction, there is a master bedroom, an open dining room/living room/kitchen, and bathroom. Upstairs there are two bedrooms, a bathroom and a loft that opens up to the area below. The Ledgewood log house construction starts at $59,600 to $119,650 for complete log house packages. The cathedral ceiling in the open concept living area makes this log house feel extra spacious and a nice room for entertaining. There are several things to be aware of when it comes to log house construction and log house packages. While it’s exciting to imagine yourself in a grand log house, you will want first to know what budget your working with for you and your family. Knowing your own budget is a good starting point for the best log house for you and your family. You don’t want to spend hours designing a vacation log house only to find that the home is not financially feasible. You want to think about things like the great room and the extras that you want like massive stone fireplaces or a soaring cathedral ceiling. As much as you may want certain luxuries you may not be able to add all of them at once. Your budget will determine what you can and can’t afford. You can keep costs down on log house packages by trimming luxuries, reducing the size of the vacation log house packages, and staying within the log house manufacturers’ standard log dimensions. You can also get more log house for the money by doing some of the construction yourself. Log house homeowners are often known to do floor tile work, stain logs, and build decks and patios. The Ledgewood is just one of the log houses you will find on the Coventry Log Homes site. You will find plenty of other log houses and log house construction to choose from on their site. With a log house to suit most every budget, preference, and lifestyle. Coventry Log Homes has five series of log houses to choose from when it comes to log house construction. There is the Craftsman Series of log houses, the Tradesman Series of log houses, the Cabin Series of log house construction, the Recreational Series of log houses, and the Timber Frame Series of log house designs. 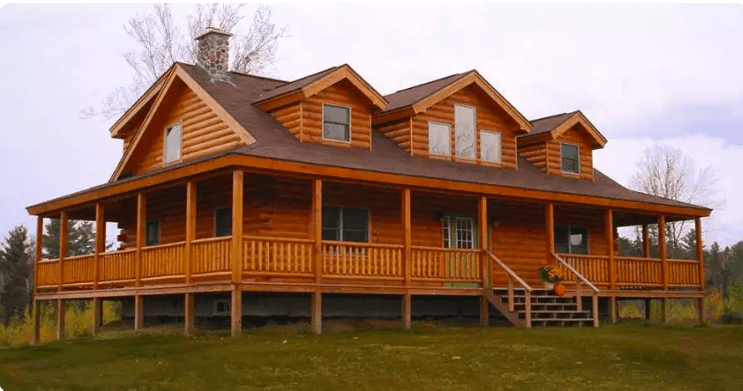 With so many log house designs to choose from, there is sure to be something to suit most any budget, need, and lifestyle of person who is considering log home living. The style of a log home is just one of the things to think about when it comes to log house construction. Other things to think about when it comes to log house design is the number of bathrooms, bedrooms, and floors in the log house construction. A good idea is to have a priority list of things that you want in your log house, something with the things that are most important to you in the log house build. More about this story can be found at: Coventry Log Homes, Inc.